Welcome to the Working with NSX Series, focused on the installation and configuration of various components within NSX. You can click me to return to the directory, or choose posts from the menu on the right. 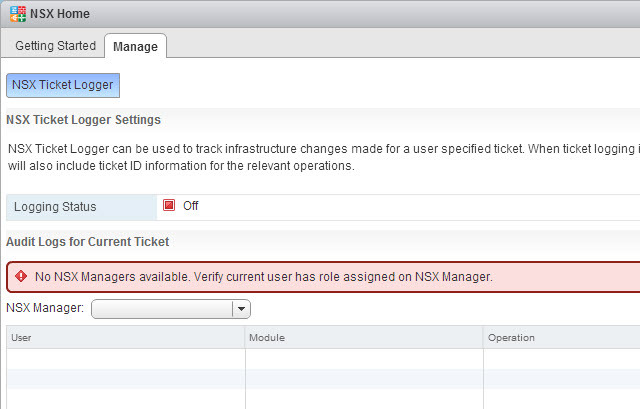 Let’s configure NSX Manager to use a new service account. I use a specific svc_<role> format in the lab, so this will be [email protected]. 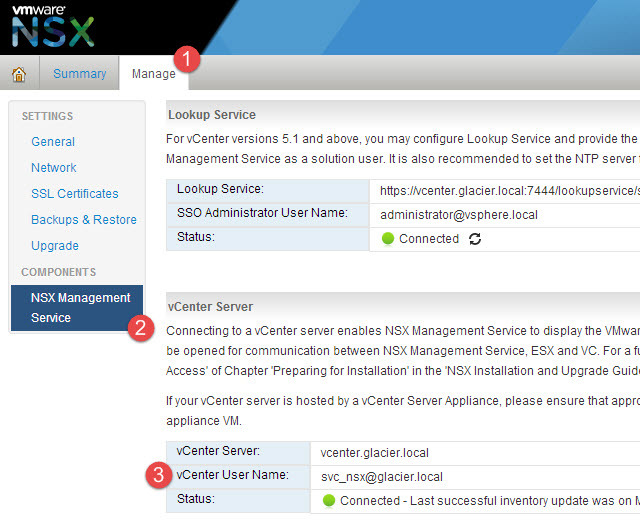 Below is the NSX Manager admin page where the vCenter Server credentials can be changed. There, that’s much better. The [email protected] service account will now be used by NSX Manager to talk to vCenter. Make sure to include the account’s domain name in the @domain.name format, such as [email protected] for my lab. Otherwise, the integration between vCenter and NSX will likely fail. Once you have clicked on the NSX Manager, which is simply “10.0.0.41” in my environment, find the Manage tab and the Users sub-tab. In my lab, I noticed that only a few users had access: the root and admin users, my [email protected] SSO 5.5 account, and my [email protected] domain account. Note: I assume this might vary depending on your vCenter version, if you upgraded to 5.5 from 5.1 or not, and if you are using the Lookup Service from vCenter Server. Auditor – Users in this role can only view system settings and auditing, events and reporting information and will not be able to make any configuration change. Security Administrator – Users in this role can configure security compliance policies in addition to viewing the reporting and auditing information in the system. NSX Administrator – Users in this role can perform all tasks related to deployment and administration of this NSX Manager instance. Enterprise Administrator – Users in this role can perform all tasks related to deployment and configuration of NSX products and administration of this NSX Manager instance. If that’s clear as mud, here’s the official documentation. Essentially, Enterprise Admin = NSX Admin + Security Admin. Note: I could have also granted access to a group instead of a user, but I rarely like to do that. It’s easier to audit specific users, and it also means that no one can accidentally give someone authority by way of an AD group slip up. The choice is yours. To verify that the new role is working, I just have to refresh the browser where the Chris user is logged on. Viola, the NSX Manager shows up! I can now add any other users or groups that might need access, especially if I need folks within my organization to audit the environment. The next section focuses on Deploying NSX Controllers via GUI and API. Excellent guide. Almost like a lab :). It good to know that you have to manage the user permissions once NSX Manager gets installed. 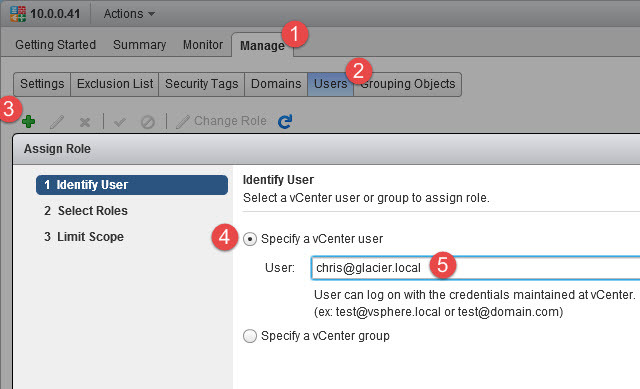 So you know exactly who has permissions on the NSX management. Noted your note about granting access to users instead of AD groups. Great post Chris, but i still have that confusion between the NSX Administrator role and the Enterprise Administrator role, may u clarify that please, what NSX Enterprise admin does NSX admin cants do? Enterprise Admins can do both NSX Admin and Security Admin related activities. I’ve updated the post to clarify further. Thanks for the series. Good walkthrough as I am prepping for my own install/lab. Thanks! Really appreciate the better understanding of the roles!